Smithsonian Affiliations is a national outreach program that develops long-term partnerships with museums and educational organizations. Through the Affiliate network, the Smithsonian shares collections, exhibitions, and research expertise with affiliated partners so that local communities can experience the Smithsonian in their neighborhoods. Smithsonian Affiliations also reaches across the country with special educational programs designed for museums, schools, and centers serving learners of all ages. What are the benefits of becoming a Smithsonian Affiliate? A Dedicated Team—The Smithsonian is a big organization; Smithsonian Affiliations helps navigate it. Affiliations staff connects partner organizations with resources and opportunities tailored to their needs. Collaborative Funding— Affiliates have the opportunity to participate in sub-award partnerships for research and education programs. Who can affiliate with the Smithsonian? Participation in the Smithsonian Affiliations program is open to any qualified non-profit, 501(c)(3) with a current Form 990 on file with the IRS; or public institutions and agencies associated with state or local government. Affiliate organizations represent a broad range of learning organizations. 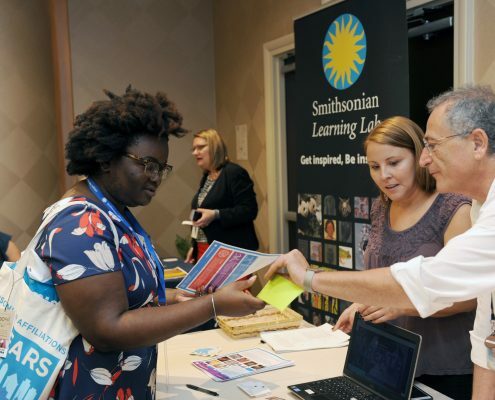 Affiliates share a common mission with the Smithsonian, a commitment to education and public service, and have the capability of bringing Smithsonian artifacts, exhibits, and programs to local communities. To become a Smithsonian Affiliate, an organization must have a physical location where it currently provides services and/or activities for the public, and must be open to the public on a consistent and predictable schedule. Organizations under development or not yet open to the public are not eligible. How does an organization become a Smithsonian Affiliate? Organizations interested becoming a Smithsonian Affiliate are required to submit an application following the steps set forth on the Proposal Process page. Disaster Preparedness and Emergency Plan If you do not have a formal plan, please tell us if emergency preparedness is part of a parent or related organization’s plan. If there is no plan, please let us know. Form 990 for 2 Years. If your organization does not file a 990, please include a current and previous year’s institutional budget. For applicants that are subsidiaries of a parent organization and do not file 990s, please provide two years of budgets for the subsidiary organization and include an explanation of what costs or activities are covered by the parent. All potential applicants are strongly encouraged to contact the appropriate National Outreach Manager for additional questions and consultation prior to submitting an application package. **Please note that if your organization is accepted as a Smithsonian Affiliate, staff members will be signed up to receive The Affiliate eNewsletter each month, highlighting Smithsonian opportunities and news for Affiliates. Staff may choose to opt-out at any time. Where do I submit the proposal? Organizations interested in affiliating with the Smithsonian Institution must submit an online proposal to Smithsonian Affiliations. The 2018 deadline is November 30. Please use the application form located on the Proposal Process page. Please review all of the required information here and gather your documents before beginning the online form. PLEASE NOTE: Once you have started the form you cannot save it and return later. How long does it take to become an affiliate? The committee will review all applications. Applicants may be called upon during the review process to provide additional or clarifying information, and will be notified when the review has been completed. A site visit may be required. If accepted, affiliating organizations must sign a Smithsonian Institution Affiliations Agreement (available upon request), and must commit to paying the annual Smithsonian Affiliations fee, currently $3,000 per year. What if the proposal is not accepted? The Smithsonian will notify the applicant if the proposal is not accepted and will explain the reasons why it was not accepted. Proposals may be resubmitted at a later time. Are there costs associated with being an affiliate? Beyond the annual Smithsonian Affiliations fee of $3,000, costs may vary depending on the type and scope of collaboration activities. Artifact loans and traveling exhibitions may have costs associated with insurance, packing and shipping, conservation, copyright clearances, installation and de-installation, security, and travel. Traveling exhibits also have stated rental fees. Travel, lodging, and per diem is required for speakers and public program participants. In some cases, Affiliates may benefit from reduced or waived fees. Costs associated with particular programs and activities are separate from and are not reduced by the annual Affiliations membership fee. Charges by Smithsonian museums and programs vary. How can I get more information about Smithsonian Affiliations? Organizations with specific questions should contact Smithsonian Affiliations at 202.633.5300, affiliates@si.edu, or use the Contact Us form. Does my organization have to be an Affiliate to collaborate with the Smithsonian? No. An organization does not have to be an Affiliate to borrow from the Smithsonian, or to participate in Smithsonian education programs. Use Smithsonian Collections Search Center to view objects. Learn more about the loan process by directly contacting the appropriate museum. Information about educational resources from the Smithsonian can be found at si.edu/educators. Can a non-collecting organization apply for Affiliation? Yes. Smithsonian Affiliations accepts applications from organizations that do not collect or maintain collections, or that do not wish to borrow objects or exhibits from the Smithsonian. Applicants interested in Affiliating on a programmatic basis (bringing new educational programs or learning strategies to communities) should provide a narrative explanation of the types of educational collaborations envisioned. All potential applicants are strongly encouraged to contact the Smithsonian Affiliations office before completing or submitting the application package. May we still apply for an affiliation if we are still under construction, or in the process of establishing our organization?